Successfully Added SATA HDD Media DVR Enclosure with AV Recording and Viewing to your Shopping Cart. SATA HDD media DVR enclosure with AV recording and viewing with a modern easy-to-use software interface. 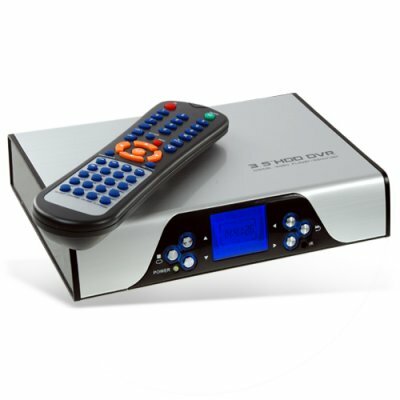 Superb digital video recording (DVR) system in a convenient form factor with a sleek brushed metal finish. This unit has two primary modes of operation, (1) connect this DVR to your TV set to digitally record and playback your favorite TV shows, and (2) load this up with your digital media files from your computer to playback on your big screen TV. This fantastic system provides convenient one-touch recording (OTR), timeshift feature, recording schedules (editable) and ethernet playback. The system also has a clear LCD status display on the front of the unit to provide helpful information to you. This fully featured system also gives HD output to either 720P or 1080i for high-definition viewing. The unit's first class functionality continues with its impressive support for a vast range of video, movie, picture and audio formats. All of this feature-rich functionality is easily accessible through the system's remote control unit and user-friendly on-screen OSD menu interface to provide you with effortless navigation. A range of connectivity options are available through the system's card slots and ports. This unit makes it easy to copy and transfer your media files effortlessly to and from the HDD multi-media system and your computer. A great wholesale price makes this digital video recorder perfect for the resale market, OEM market, or personal/company use. As always, it is available direct to you from the original source for wholesale direct from China electronic products, Chinavasion. Note: This product is not sold with a Hard Disk included. You will need to purchase a hard disk drive separately. Also supports the copyfrees solution. Would be nice if the unit provided NAS support, but if you know telnet commands the unix cp command works fine. Their is a network copy command using menues from the remote, but what fun is that. The suplied software will only format a 500gb disk, haven't tried to format 1.5tb to fat32 using fat32format yet. Does not support NTFS for writes, reads work fine. THIS IS EASY TO SET-UP. READ THE INSTRUCTIONS ON THE DISK. I USED A 500 GB HARD DRIVE. LOVE THE PICTURE OF MOVIES AND RECORDED PROGRAMS. A DEFINITE BUY IF YOU LOVE YOUR MEDIA GADGETS.